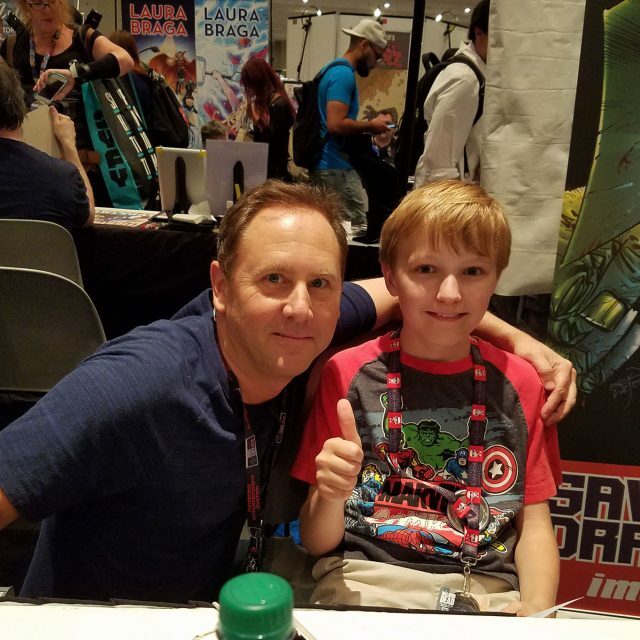 I’m here with Reilly Brown, a comic book artist, illustrator and writer who started self-publishing comics more than 15 years ago. 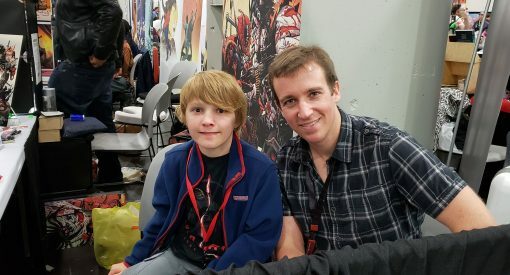 Since then he has done work for Marvel, DC, Dark Horse and Archie and is most well-known for his work on Deadpool, Amazing Spider-Man, Incredible Hercules and Lobo. He also happens to be the nephew of my science teacher! Reilly, I’d like to ask you a few questions. Carl: First, my science teacher is your uncle. What can you tell me that will help me get an A in his class? Reilly: Let me think. He’s got a motor boat, he loves motor boats. He loves… I don’t know. He’s just a big weirdo. So, if you come up with any weird fact it’ll blow his mind. Like, you’ll be his favorite student ever. Carl: Did you want to be become a comic book artist when you were a kid? Reilly: Yeah. I always loved drawing. I loved art class. Even when I was in science or math class I’d be doodling in my notebooks. I went to college and studied illustration at VCU in Richmond, Virginia and after that I just went to a lot of comic conventions and showed off my artwork. Carl: Nice! What comics did you read when you were a kid? Reilly: I love the X-Men and Spider-Man, those were my favorites, and Calvin and Hobbes. Carl: Calvin and Hobbes is a really great comic. Reilly: What’s your favorite comic? Carl: Well, my favorite cartoony comic strip has to be Foxtrot. But my favorite comic book is probably Spider-Man. Reilly: And Deadpool! And Deadpool! He meant to say Deadpool! Carl: (pointing to Dad the cameraman) He doesn’t let me read Deadpool. So, blame him! Reilly: Oh, so if dad wasn’t around then you could tell me the real truth. Carl: Out of all of your art, which was the most fun to work on? Reilly: Deadpool was a lot of fun. Deadpool and Hercules were the most fun. I like comics where the characters have a lot of personality and they kind of go over the top; a lot of jokes and stuff like that. Those were a lot of fun. Carl: Deadpool seems to just keep getting more and more popular. Why do you think so many people love this character? 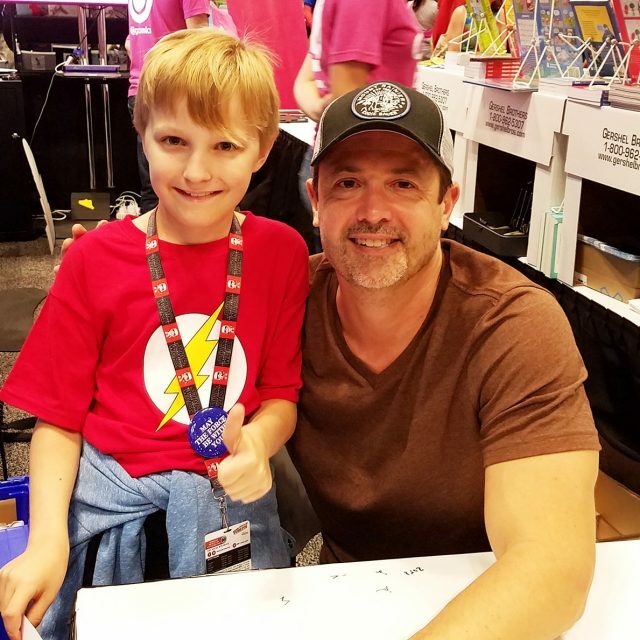 Reilly: I think because he’s really like a great character for the younger generation…I mean, not that parents like their kids watching it or reading it or whatever, but when I’m drawing it, I feel like the ideal audience is, like, an 11 year-old, because he’s sarcastic, and he’s over the top and he breaks the fourth wall…he seems very much like a video game character but, because he’s in a comic book, you kind of get, you get more story out of him. And, I also think, in an age where everyone is very judgmental and moralistic, people are kind of attracted to a sarcastic character who’s willing to just give his opinion, not care what anyone else thinks, and, you know, go on – no consequences. Or, the consequence is that he gets blown up, but he gets better, so it’s fine. So, he’s able to talk about subjects and tell jokes that other characters wouldn’t get away with. Carl: Has anyone asked you to do a cameo in a Deadpool movie? Because you should totally do that. 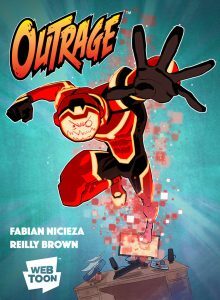 Carl: Your uncle told me I should check out your project with Fabian Nicieza, called Outrage, which is about a virus that attacks people who bully other people online. How did you two come up with the idea? Reilly: We were just sitting around, having lunch together one day and Fabian said, there was some controversy going on online, as there always is. He was like, “you know, the other day I was reading something on Twitter and I was, like, I wish there was a button I could push where on the other side of the screen my hand would come out and just smack the guy.” We were like, what if there was a character that could do that? And we made a story around that. We just started riffing and just talked about how much fun that would be. And, so, next thing you know, here we are. Carl: Nice! Will Outrage eventually be a book or is it only on Webtoons for now? Reilly: Right now it’s exclusively on Webtoons, it’s free. Every week we have a new chapter, so make sure you check it out. But yeah, that’s the only place you can get it from. Carl: One last question, are you having fun at the show? Reilly: Yeah, man, I’m having a great time! This is a great show. New York Comic Con has, I think it has the most artists. Like, the Artist Alley area of the show is bigger than any other show. There’re so many awesome, talented people here. It’s great to just, you know, walk around and talk to friends of mine in the business or just people who were heroes of mine when I was younger that I can kind of talk to, now that I’m a professional, too. “Hey man! I really loved your stuff as a kid.” They’ll tell me that they like my work, and that’s really a lot of fun. Carl: Nice! Thanks for answering my questions. It was nice meeting you. And put in a good word for me with your uncle!